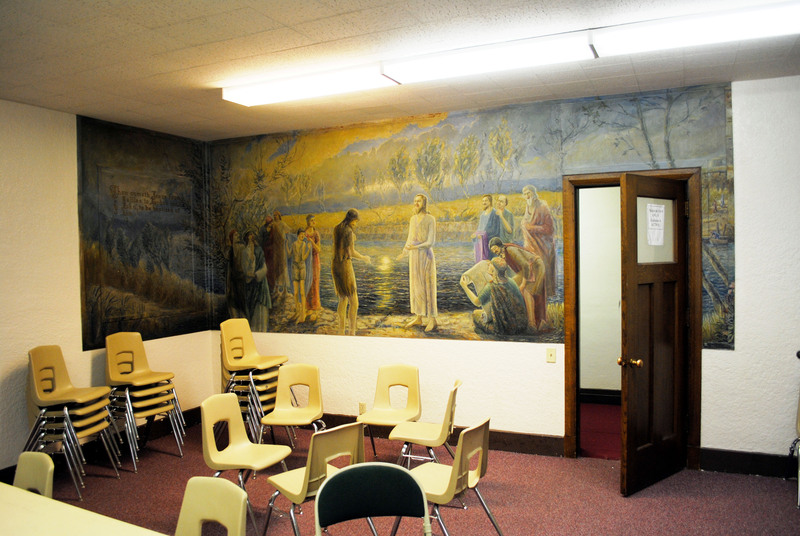 In the original building, the baptismal font was located directly below this painted mural. Rather than the painting, though, there was some type of art glass window centered in the wall. In 1936, decorative railings were added around this font. Sometime prior to 1975, the art glass window was removed and this mural was added over the font. The text on the left wall of the painting says “Then cometh Jesus from Galilee to Jordan unto John, to be baptized of him. And in the lower right corner is the artists name, C. E. Tillotson. During a building remodel in 1975, the font was moved to the other side of the room (to the right of this picture) and directly linked to new showers, changing rooms and restrooms. The font hole was filled in, floored over and the mural was preserved.